I’m not totally sure why I picked up Christopher Isherwood’s Goodbye To Berlin the last time I was at a used bookstore—certainly, it’s a slim volume, and that’s appealing when I know I’m going to be carrying something in my bag while commuting, or trying to finish a book in the 10-minute increments I get a chance to read before I have to do something else. But I’ve also been interested in stories from the Weimar Republic era in Germany after reading The Artificial Silk Girl, which I picked up on a trip to Chicago well before I realized I’d be moving here. 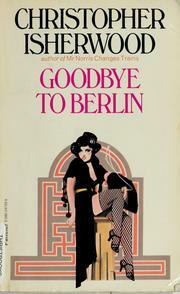 Both Goodbye To Berlin and The Artificial Silk Girl are narrated with a distinct sense of sadness, as they’re looking back on a period of cosmopolitanism and cultural vigor that would be utterly destroyed by the rise of the Nazi movement and the subsequent carnage of World War II.